As a result of resorption of the alveolar processes due to tooth loss, the maxillary alveolar ridge line is narrowed because the ridges are resorbed in the direction of inclination. The setup of teeth for complete dentures can interfere with the statics. The gap from the vestibular fornix to the ridge line will vary in size, depending on the degree of bone reduction. Where the ridges are highly developed, there may be vestibular undercut areas that are suitable as mechanical retentions for the denture base. There is usually a firm, immobile, poorly compressible mucosa on the rounded alveolar ridge.The mobile mucosa of the cheek and lip area extends in the arch as far as the alveolar process and forms the vestibular fornix. 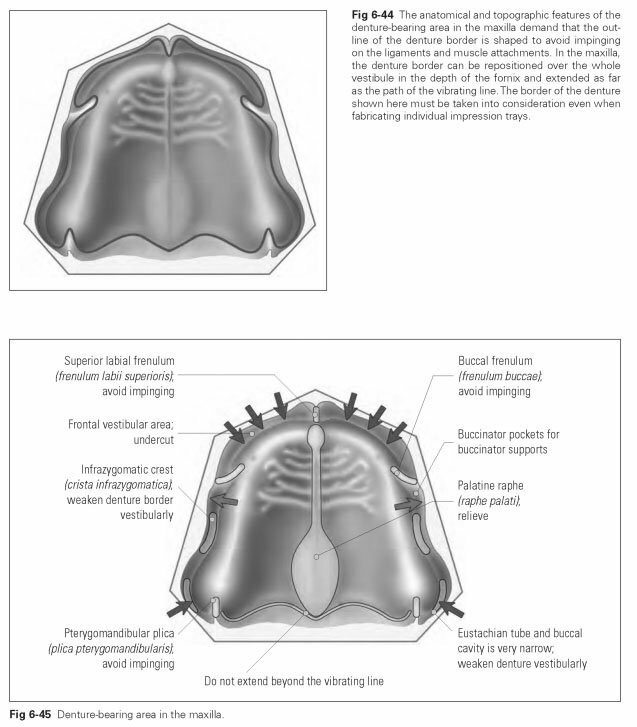 Vestibular fornices (fornix vestibuli superioris and inferioris) are the superior and inferior limits of the vestibule, which can be interrupted by ligaments, can be moved only tangentially to the alveolar ridge by cheek and lip muscles, and may be slightly widened. In the vestibular fornix, the denture border should form what is known as a valve-type seal, which prevents air from getting underneath the denture. The exact path of the fornix, given the variable arrangement of the different forms of mucosa, can only be recorded by means of a functional impression so that the denture border will not cause interference even during movement. The denture base should not impinge on ligaments and muscle attachments in the vestibular sulcus as areas for reduction (Fig 6-44). The superior labial frenulum (frenulum labii superioris) must be avoided throughout its height. If it attaches at the middle of the alveolar ridge, it can be surgically shortened. The buccal frenula (frenulum buccalia), left and right and sometimes two frenula on each side, which can be located level with the premolars or the canine, must not be restricted in their movement; if they are, serious pressure points can develop. The infrazygomatic crest (crista infrazygomati-ca), as a bony base in the fornix, can give rise to pressure points if the edge of the plate is too long or too thick. The eustachian tube/buccal cavity is the area of the fornix at the maxillary tuberosity that is often very narrow and undercut.The denture flange here must not be worked too prominently and thickly because the cheek muscles will narrow the space even further when the mouth is opened and during lateral movements. The maxillary tuberosity (tuber maxillae) is not resorbed during tooth loss. The denture base should fully cover this part of the palate because it can provide support to the denture. Furthermore, pronounced tubes offer excellent mechanical retention. In extreme cases, a maxillary tuberosity can be surgically smoothed if it protrudes too much. The pterygomandibular plica (plica pterygo-mandibularis) is a distinct fold of mucosa that attaches in the middle behind the maxillary tubercle and must be avoided by the denture base because it is tightened during mouth opening and will lift up the denture. The vibrating line is the borderline in the transition from hard to soft palate, beyond which the denture border should not extend; if it does, sensitive patients may experience a retching sensation. The median raphe of the palate (raphe palati) is the counterpart to the bony palatine suture, which is only covered by a thin, poorly compressible mucosal layer. It may be thickened in the dorsal area into a palatine torus (torus palatinus). A raphe with a torus should be covered or relieved if it is prominent; the palatine torus must always be relieved or, in the case of skeletal plates, completely avoided because otherwise the denture will rock, cause pressure points, and may even break. The incisive papilla (papilla incisiva), as the anterior tip of the palatine raphe, must be relieved on the denture base, and skeletal plates must be completely avoided. If not, pressure points can arise. If the nerves are constricted at the papilla, this can impair the patient's subjective sense of taste. This clouding of the sense of taste can occur because pressure on the papilla interferes with the sense of smell, which, combined with the tongue's sense of taste, makes up the whole sensation of taste. The alveolar jugae (juga alveolaris) should be reproduced in the area of the anterior teeth for esthetic reasons but, in the posterior area, should not be impinged on for reasons of oral hygiene. Figure 6-45 illustrates the denture-bearing area in the maxilla.